﻿ Amrap's AirIt | Australian Music Radio Airplay Project :: Blues/Roots :: Dom Mariani & The Majestic Kelp - Kelp Are Go! Amrap's AirIt | Australian Music Radio Airplay Project :: Blues/Roots :: Dom Mariani & The Majestic Kelp - Kelp Are Go! 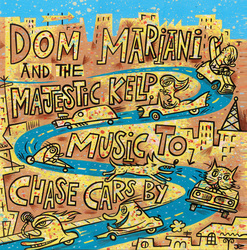 Dom Mariani & The Majestic Kelp - Kelp Are Go! The last time I spoke with the great Dom Mariani (of The Stems, DM3, etc), he was talking about how much pleasure he was getting from guitar instrumentals; and how he dearly wanted to make an all instrumental album with his current outfit The Majestic Kelp. The core band of Mariani, drummer Robbie Scorer, bassist Stu Loasby and Tobias Gosfield on Hammond and Yamaha organ, are joined by guests galore to add colour and texture to rich guitar tones and swelling and crashing rhythms. Renowned Australian guitar hero Dave Hole guest stars with some tasty dobro on the bluesy opening track ‘Drivin’ South’ to set the scene, with Mariani’s tremolo treated electric guitar sparkling like the sun on the sea. But there’s far more to Songs To Chase Cars By than just surf music – soul, blues and fuzzed-out rock all contributing to this intoxicating musical cocktail. The freaked out instrumental stylin’s of guitar pop wunderkind Dom Mariani (Stems, DM3, Someloves) crash between the guard rails of Morricone, psychedelic fuzz, swampy blues and surf guitar.